"breathtaking in its beauty and its profound depth"
"The first page turner poem!" "[A] powerful, intelligent book... completely persuasive"
"[T]his book could get stunningly popular, especially if the people who read literary memoirs, but don't read much current poetry, realize that it's a poem but it's also a memoir." Degrees of Latitude is a book-length, narrative prose poem that maps the geography of a woman's life. The book traces the coastline of experience and explores the interiors of emotion and consciousness as the narrator seeks to discover her place on the map at the beginning of the 21st century. Like every epic from The Odyssey onward, Degrees of Latitude involves a journey and a spiritual quest. But this is a woman's epic. Here the journey is as much emotional as physical; the quest is not so much for adventure as for home; and the search is not for the "other," but for a whole self in a whole world. The poem is organized as a journey from North to South Pole across six latitudinal zones and the Equator. Along the way, the narrator's own story unfolds, together with a picture of her environment gleaned from other people's stories, journals, cartographic images, and other sources from a period that has done its utmost to destroy human and linguistic meaning and coherence. Degrees of Latitude is the record of one woman's attempt to find a place to stand in a restless and uneasy world. PRAISE FOR Degrees of Latitude, a book-length, narrative prose poem, from Four Way Books - November, 2007. Laurel Blossom's Degrees of Latitude is almost a lyric novel, so sweepingly re-imagined is the life it illuminates, but it is as well an expedition into territory seldom explored in lyric mode. Blossom begins her journey on an ice-breaker during the white nights of a polar north — cold as childhood — and then turns her gaze upon the uncharted regions of family history, secrecy and illusion, bravely and with uncommon self-knowledge, in deft and beautifully cadenced language that belies the arduousness of her task. This work crosses, formally and insightfully, the traditional borders of confession and memoir, and moves into the unknown, mapping what is visible as well as what has, until now, been hidden. I have been waiting a long time to read this book, and it is very much worth the wait. 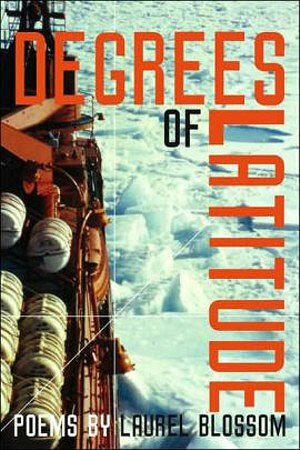 Degrees of Latitude is a remarkable book-length poem that captures our culture in crisis and celebration. Blossom has extended, and renewed, her already formidable work. She has created a visionary, deeply felt, meditation set in every emotional, sexual, political, addictive and moral landscape of the body and soul. Through lyric meditation, overheard conversation, personal anecdote, newspaper entries, and journals, she charts an interior life not seen before but at once recognizable. I love how this book renews one's faith in the possibilities of poetry, and in its power to delight with true innovation and luminous renewal. As natural as speech or thinking, the poems in Degrees of Latitude consist mostly of single sentences, alone, like persons, and as alive. In developing the conceit of the great globe's zones. Laurel Blossom's decision to make the world of the personal, and of the global, "literal" strikes me as poetic justice. We have the wounds of the earth and the wounds of its inhabitants made transparent by blunt truths. This is an intimate book, without explanations or conclusions for our suffering. Rather, the poems perceive our inheritances — of the body and of the planet — critically and graphically. Order Degrees of Latitude now! Go to Four Way Books. At sea: midsummer midnight. Night as (light as) day. Ice so blue it's frozen sky lit from within, above, below. In my cabin, pictures of my son and me in Nairobi, me and my father at the North Cape, Lionel at home in New York City. On the ship's P.A., Belafonte singing Day-O. Ivory gulls, like memory, at the edge of vision. My mother on the green green lawn, laughing up at me laughing, drying my eyes. Following channels through the ice (the mind) called leads. Awakened by a great crash of ice against the hull. Pitching and rolling as if through water, grinding as if through rock. Our homely Russian nuclear icebreaker, crazy red dot on a flat blank map. I thought you were opposed to nuclear power, said Will. On the bridge, the Captain watches the ship shove up, over one last pressure ridge. We know from a satellite radio beam, like a finger of light: YOU ARE HERE. We are one hundred warm-blooded human creatures. In our red down jackets eating hamburgers rare and french fries iced with tomato ketchup. Taking each other's living pictures by a flagpole on a shroud of moving ice. Armed guards walking the invisible perimeter, Rod Stewart crooning to the bent horizon. Polar bears sniff the vast, reverberated air. And the Captain says he came up out of the swimming hole wanting to shout for joy, but couldn't. The cold had taken his breath away. Trap door, coffin lid, going under thrill. I came up wanting to shout: Get me out of here! Five kms. deep, 3°(F) below freezing. Ladies and gents, I did shout it! from Degrees of Latitude, Four Way Books, 2007.